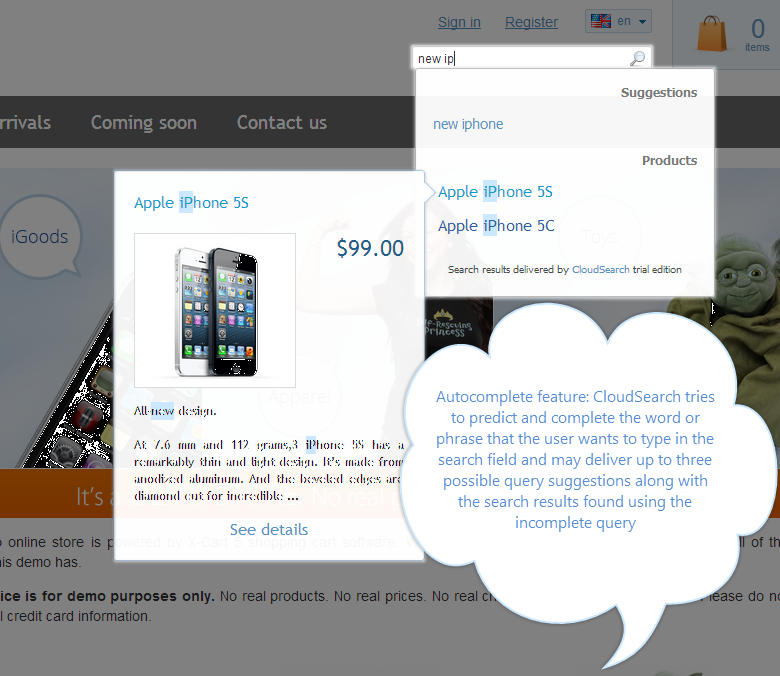 CloudSearch is a powerful search & navigation engine for X-Cart 5. It provides smart and fast product search and rich filtering experience to your customers, increasing your conversion rates and sales. According to Forrester Research, 43% of customers go directly to the search box. What's even more important, searchers are 2-3x more likely to convert and they spend more too. CloudSearch leverages this group of qualified customers providing them with the top-notch product finding experience. Smart & Lightning-Fast Search. Your customers will be thrilled with blazingly fast and extremely relevant search results and suggestions. Powerful Navigation & Filters. CloudSearch goes beyond simple search, delivering seamless filtering experience. It effectively redefines the meaning of powerful navigation in your store. Analytics, Customization & Promotion. Analyze what your customers are searching for, what they find and what they don't. Use this knowledge to improve your offering with the help of our search tuning & merchandising tools. This is a one of the best X-Cart add ons we have ever purchased. Our conversions are up 9.02% over last years same month. 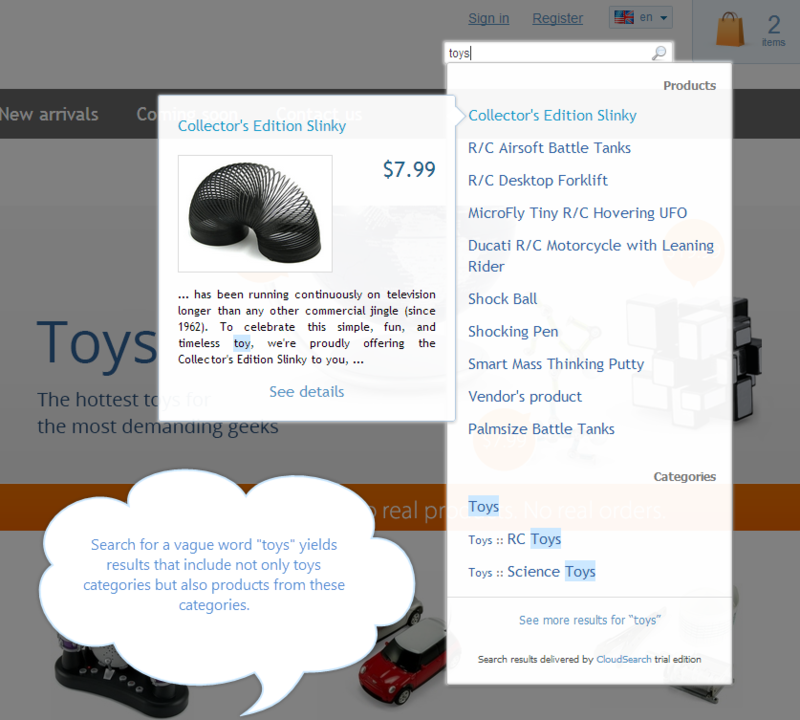 Search results start to be displayed instantly and are refined as the user continues typing. The user can stop short of typing the entire word or phrase at any time and choose one of the suggested options. Based on the industry leading enterprise search technologies, CloudSearch recognizes word forms and provides other advanced full-text search capabilities. 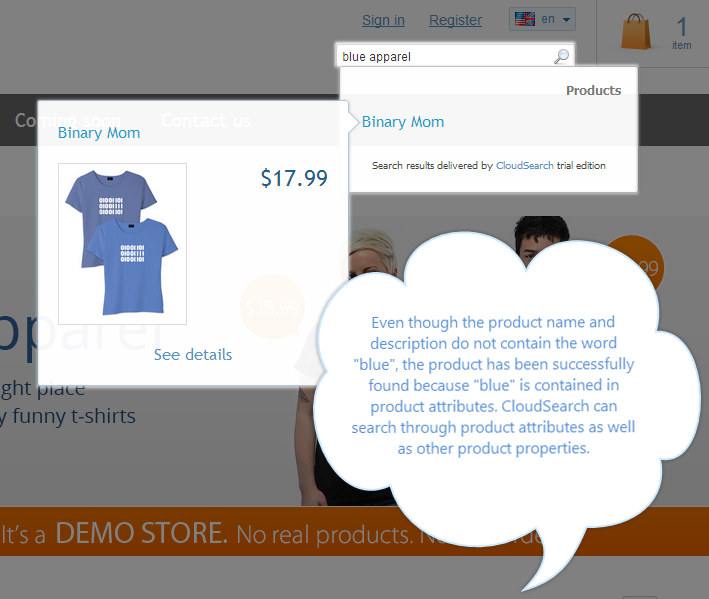 The CloudSearch widget in your store interacts directly with our cloud without increasing load on your server. Search through categories and static pages in addition to product properties such as name, description, SKU, attributes and category. Many clients report increased conversion rate, some even get as much as 25% gain! Even if a word has been misspelled, the customer can still find the product by using a closely related option from the presented list. Promote your selected products to customers by specifiying target search queries. Find out what your store visitors searched for, what search terms were the most popular and what popular queries returned no results. Specify words or phrases that should be treated as equivalent to improve search results of specific queries. 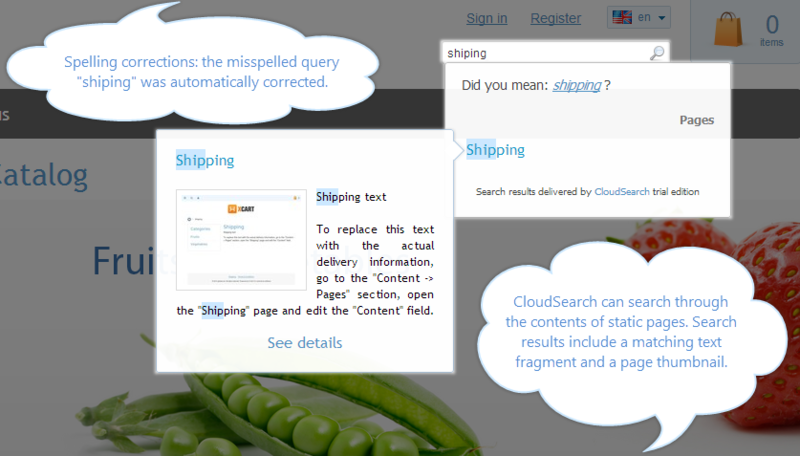 CloudSearch works great not only with the English language. We have clients successfully running CloudSearch with French, Greek, German, Slovenian, Russian, Spanish, Arabic and many other languages. Performance and feature updates are available automatically without the need to upgrade your client software. With this module, you can find and browse the entire shop from within the search box to get to the product you need, most users search according to the built in stats. The included feature displaying thumbnails offer the ease to match its the product where colours or other differences may bring up several results. This is one of the best X-Cart add-ons we have ever purchased. Our conversions are up 9.02% over last years a same month. All X-Cart 5 editions include a free 30-day trial of CloudSearch Retailer plan. Need custom limits or Enterprise solution? Contact us or call us at 1-800-657-7957.